1. Hug your person for a count of at least 10 seconds. 2. For 10 minutes, listen to understand, not to reply. Be present. eyes for a 10 second gaze. 4. Read out loud to someone for 10 minutes. 5. Take 10 seconds to verbally express appreciation and gratitude. 6. Go for a 10 minute walk together. 7. 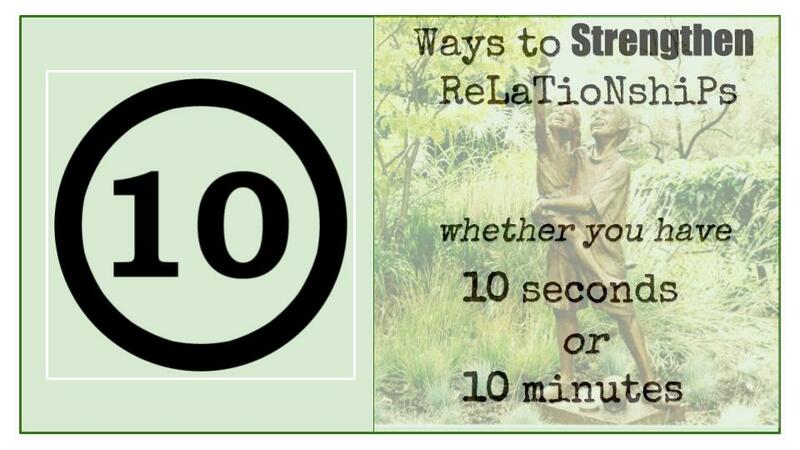 Take 10 seconds to write a sticky note to leave in a pocket or on a dashboard. 8. Chat for 10 minutes before going to bed. 9. Do something artistically creative for 10 minutes. 10. Rub an achy back or feet for 10 minutes.